Having a clean house looks pleasant and eases anxiety: Coming home after a long day to a clean house feels much nicer than a cluttered house and a sink full of dishes. But what if you don’t have the time to thoroughly clean often? Or what if you just feel too lazy to regularly clean? Well these quick tips will help you keep your home tidy even if you hate cleaning or you’re short on time. So check them out and let me know what you think! While this task itself may seem mundane, making your bed every time you wake up makes your room look and feel cleaner than a messy bed. And it’s easy to do! It may seem like a good idea to put a dish in the sink to soak before cleaning it. But unfortunately, this usually leads to us forgetting it for another time. Instead, avoid a full sink by rinsing the dish immediately and putting it in the dishwasher. An easy way to keep your home smelling fresh without the cost and effort of various air freshening techniques is to tape a dryer sheet to your air vents. Then your home will always smell fresh. A great way to clean up your kitchen is to race your microwave. The next time you re-heat something, pick a task and do your best to complete it before the microwave goes off. The easiest way to clean your glass stovetop is to cover it with baking soda, spray some vinegar on top, and lay a damp towel on top. Leave this concoction for fifteen minutes and then you can wipe off the stovetop easily with a little bit of scrubbing (a razor blade works well for this). Prevent having to clean future spills by lining your refrigerator shelves with press and seal cling wrap. It makes spring cleaning a breeze and any unwanted spills are easily cleaned up with zero hassle. Keep your kitchen clean when cooking dinner by cleaning as you go. Every time you are done with a pot, pan, or utensil, simply rinse it and throw it into the dishwasher. If you dirty a countertop, be sure to wipe it down before moving onto the next step in your recipe. This prevents a sink full of dirty dishes and allows for a clean kitchen by the time dinner is ready to eat. An important step in preventing having to constantly clean is to be sure to have a place for everything in your house. Magazines, television remotes, pots and pans, etc. If everything has a specific place that you return it to when you’re done using it, then you won’t have to tidy up as often. Dust your lampshades and upholstery with a lint brush while you sit and watch television. It’s an easy way to clean with very little effort. While this may be the most expensive cleaning tip for a lazy girl, it is by far the most time-saving. Investing in an automatic vacuum cleaner will probably save you the hassle of ever having to sweep or vacuum your home again. You can easily find a Roomba here! 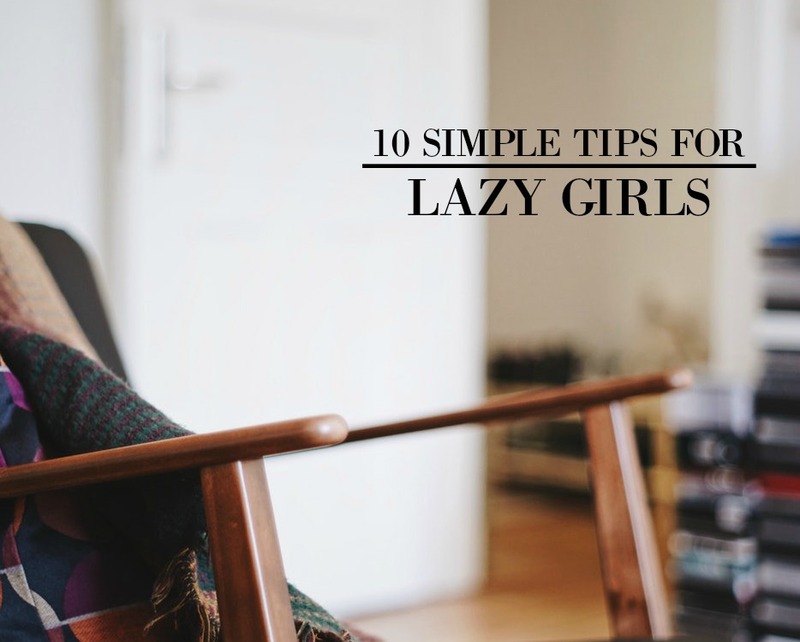 These easy cleaning tips fit perfectly into a lazy girl lifestyle. Following these tips will help maximize cleaning while minimizing effort, allowing you more time to do the things you love.